Happy Birthday, Your Holiness! The article from the Georgian government’s media outlet Agenda.ge is worth reading in its entirety, as it provides a concise summary of Patriarch Ilia’s career, the state of the Church in the Soviet era and its current state. The tenfold increase in operating churches and monasteries, fifteen-fold increase in serving clergy, temples overflowing with parishioners every weekend, and widespread attraction of Church life for Georgia’s youth are remarkable achievements under Patriarch Ilia’s stewardship of the Church in Georgia. May God grant him many years to come. ……. The Prime Minister of Georgia, the President and the United States’ Ambassador to Georgia released special congratulations today for Ilia II…..
…The Patriarch had to take the responsibility of being a Catholicos-Patriarch of Georgia in a very hard period, when Christianity was suffering significant suppression from the Soviet Union time ideology. Ilia II was born as Irakli Ghudushauri-Shiolashvili in Vladikavkaz, currently Russia’s North Ossetia. …..He is a descendant of the influential eastern Georgian mountainous clan with family ties with the former royal dynasty of Georgia – Bagrationi. In 1967 he was consecrated as the bishop of Tskhumi and Abkhazeti in west, currently occupied region, and elevated to the rank of metropolitan in 1969. After the death of the Patriarch David V, he was elected the new Catholicos-Patriarch of Georgia on December 25, 1977. In the new position Ilia II initiated a range of reforms, enabling the Georgian Orthodox Church to largely regain its former influence and prestige by the late 1980s. In 1988 there were only 180 priests, 40 monks, and 15 nuns for the faithful, who were variously estimated as being from one to three million. There were 200 churches, one seminary, three convents, and four monasteries. During the last years of the Soviet Union, Ilia II was actively involved in Georgia’s social life…..
….Currently there are about 2,000 acting churches and monasteries in Georgia and up to 3,000 spirituals (parish clergy and monastics). Gori, a small town in eastern Georgia that became the epicentre for the 2008 Russia-Georgia war, is celebrating Okonoba, the day of the icon believed to be Gori’s patron. This holiday is a big deal for the Gori population as they believed the ancient icon miraculously returned home after it went missing when an armed conflict broke out in Georgia’s breakaway Tskhinvali (South Ossetia) region in the 90s. Okoni Triptych, a unique and precious 11th century icon was lost in the 90s but miraculously reappeared at Christie’s, the world’s largest art business and a fine arts auction house in 2001. The initial price of the icon was $2 million USD and it was presented at Christie’s in Geneva, Switzerland by a Russian citizen. After lengthy negotiations between the Georgian and Swiss governments, Christie’s Auction House and the Georgian Orthodox Church, the icon was finally handed to the Georgian side. Okoni Triptych, 11th century icon, is currently kept at Georgia’s National Museum in Tbilisi. Scientists believed the three-panelled silver-bound ivory icon featuring Virgin Mary, Jesus Christ and John the Baptist was made in the Byzantine Empire in the 11th century and brought to Georgia as the dowry of Queen Helen, the wife of Georgian King Bagrat IV and the niece of Byzantine Emperor Romanoz Agririos. The icon was kept in Gori district in a church built upon the order of King Tamar of Georgia until 1924 when it was brought to the Tskhinvali Museum. The icon was stolen and smuggled out of Georgia after the armed conflict broke out in the Tskhinvali region. Currently, Okoni Triptych is kept among other National Treasury of Georgia at Georgia’s National Museum in Tbilisi while a duplicate was created especially for Gori. Gori locals honour the icon every year on the Sunday following Easter. via Agenda.ge – Georgia honours unique Georgian icon returned home after being lost during war. Today is the Feast of the Annunciation, previously discussed here, when the Ghvtismshobeli was addressed by the angel Gabriel and told of her destiny as the Mother of God. This is one of my favourite hymns for this feast, although it is not Georgian. Called “The Pre-Eternal Council” or “Sovet Prevechny”, it was written by Russian composer Pavel Chesnokov. Rejoice, O depth hard to fathom! and lofty ladder, which Jacob beheld! Rejoice, O divine jar of Manna! Rejoice, annulment of the curse! Pavel Chesnokov was arguably the foremost Russian composer of sacred choral works during his time. He wrote around 500 choral works, about 400 of them sacred. Chesnokov was a devout follower of the Russian Orthodox Church and was inspired to write most of his works for worship in that faith. His best-known composition, one of the few works he is remembered for today, is Salvation is Created, a Communion hymn based on a Ukrainian chant melody. During the Soviet era, Chesnokov was better known as a choral conductor than composer. Indeed, he was praised, even by the Soviets, for his skills in choral conducting, though they remained hostile to his sacred music throughout his lifetime……..
…..Pavel Chesnokov was born into a musical family on October 12, 1877. His education was extensive: his first advanced studies were at the Moscow School of Church Music (he graduated in 1895); he next worked privately with composer Sergey Tanayev and later studied at the Moscow Conservatory (graduating in 1917), where his list of teachers included Mikhail Ippolitov-Ivanov. In the end, Chesnokov would go down as one of the most highly trained musicians in Russia, having spent years studying solfège, composition, piano, and violin. But Chesnokov was not just a student during these years: he taught choral conducting in Moscow, served as choirmaster or conductor at several prominent schools and choirs (most notably the Russian Choral Society Choir), and most importantly, composed a spate of sacred choral works, including his most popular, Salvation is Created (1912). After the Bolshevik Revolution, Chesnokov was forced to abandon composition of sacred music, owing to sanction against such activity by the anti-religious Soviets. He thus embarked on composition in the secular choral realm. From 1920, Chesnokov headed a choral conducting program at the Moscow Conservatory. He also remained busy, regularly conducting the choirs of the Bolshoi Theater and Moscow Academy. In addition, Chesnokov became the choirmaster at Christ the Savior Cathedral. In 1933, however, on orders from Stalin, the cathedral was demolished to make way for construction of a skyscraper that would never be built. Chesnokov became so distraught over the cathedral’s destruction that he stopped composing altogether. He continued teaching and conducting various choirs in Moscow until his death there on March 14, 1944. “Under the state atheism espoused by the USSR, many “church institution[s] at [the] local, diocesan or national level were systematically destroyed” in the 1921-1928 antireligious campaign. As a result, after the Revolution and, more specifically, the death of Vladimir Lenin, the prominent site of the cathedral was chosen by the Soviet leader Joseph Stalin as the site for a monument to socialism known as the Palace of the Soviets. This monument was to rise in modernistic, buttressed tiers to support a gigantic statue of Lenin perched on top of a dome with his arm raised in the air. The economic development in Russia during the 1930s required more funds than the government had at the time. On 24 February 1930, the economic department of the OGPU sent a letter to the Chairman of the Central Executive Committee asking to remove the golden domes of the Christ the Saviour Cathedral. The letter noted that the dome of the church contained over 20 tons of gold of “excellent quality”, and that the cathedral represented an “unnecessary luxury for the Soviet Union, and the withdrawal of the gold would make a great contribution to the industrialization of the country.” The People’s Commissariat of Finance did not object to this proposal. 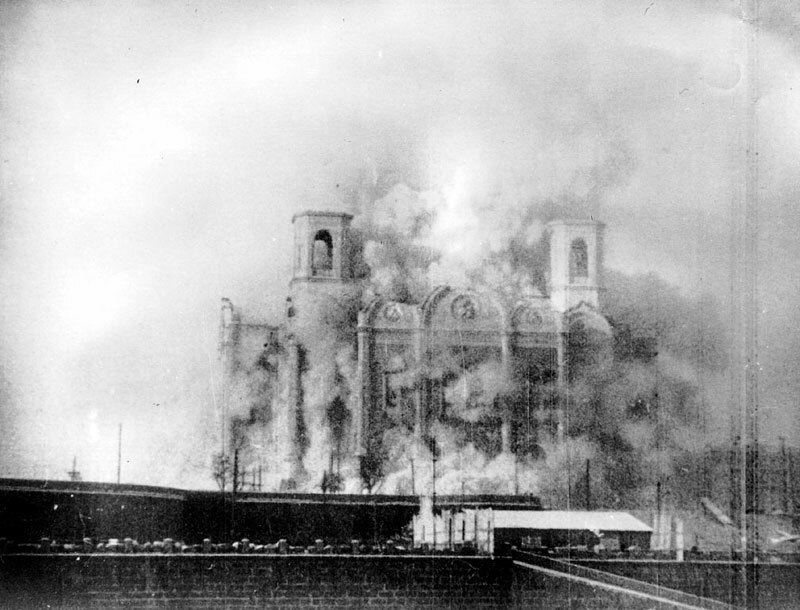 On 5 December 1931, by order of Stalin’s minister Kaganovich, the Cathedral of Christ the Saviour was dynamited and reduced to rubble. It took more than a year to clear the debris from the site. Some of the marble from the walls and marble benches from the cathedral were used in nearby Moscow Metro stations. The original marble high reliefs were preserved and are now on display at the Donskoy Monastery. For a long time, these were the only reminders of the largest Orthodox church ever built. For those with Georgian language competence, this short documentary from the Georgian Patriarchate’s Ertsulovneba TV Station examines the Annunciation and contains many traditional Georgian hymns for this feast. Today is the second Sunday of the pre-Lenten period, with Meatfare Sunday (the last day of meat consumption before Pascha) falling next Sunday. 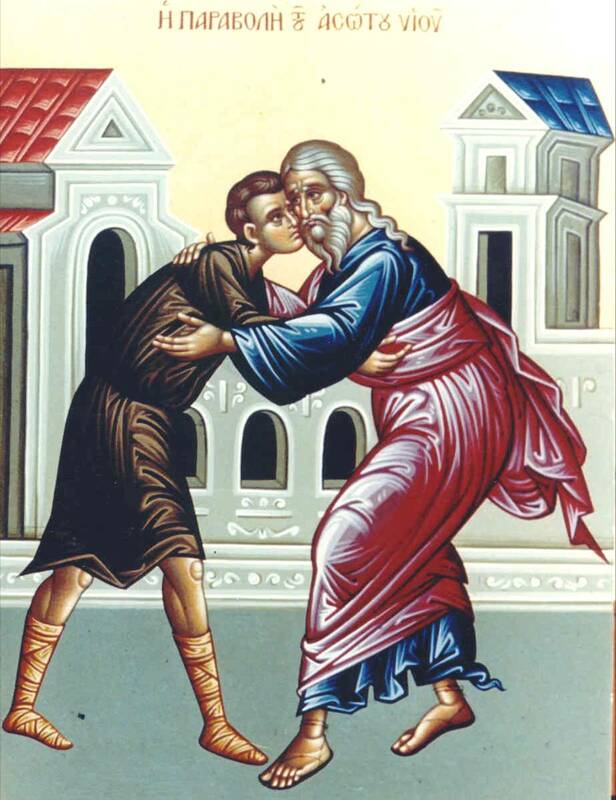 Following from last week’s theme of repentance and forgiveness, the theme of today is the Parable of the Prodigal Son. “11 And he said, A certain man had two sons: 12 and the younger of them said to his father, Father, give me the portion of goods that falleth to me. And he divided unto them his living.13 And not many days after the younger son gathered all together, and took his journey into a far country, and there wasted his substance with riotous living. 14 And when he had spent all, there arose a mighty famine in that land; and he began to be in want. 15 And he went and joined himself to a citizen of that country; and he sent him into his fields to feed swine.16 And he would fain have filled his belly with the husks that the swine did eat: and no man gave unto him. 17 And when he came to himself, he said, How many hired servants of my father’s have bread enough and to spare, and I perish with hunger! 18 I will arise and go to my father, and will say unto him, Father, I have sinned against heaven, and before thee,19 and am no more worthy to be called thy son: make me as one of thy hired servants.20 And he arose, and came to his father. But when he was yet a great way off, his father saw him, and had compassion, and ran, and fell on his neck, and kissed him. 21 And the son said unto him, Father, I have sinned against heaven, and in thy sight, and am no more worthy to be called thy son. 22 But the father said to his servants, Bring forth the best robe, and put it on him; and put a ring on his hand, and shoes on his feet: 23 and bring hither the fatted calf, and kill it; and let us eat, and be merry: 24 for this my son was dead, and is alive again; he was lost, and is found. And they began to be merry. The simplest interpretation of this is for Christians to imagine themselves as foreigners in a distant land, far from their Father’s house and full of regret for their reckless and disobedient conduct. Through the Lenten period, we are to engage in metanoia (repentance or “change of mind”) and to follow the long and winding road back to God where we belong. The parable assures us that our repentant return home will be greeted with joy by the Father, not justified by our worthy acts but through God’s forgiveness and love. One can think of “the Father’s House” as being salvation and reunification with God. The prodigal chose to walk away from salvation by his own free will and to live foolishly and sinfully, and by his own free will he resolved to repent, to return home and to live humbly under the authority of his Father’s will. Concurrently, the elder brother, by removing himself from the household out of resentment at the favourable treatment the prodigal son received, at least temporarily has removed himself from salvation and God’s presence. In the Georgian context, it is worthwhile considering how we, as individuals or as a Church, fit into the framework of this parable. Over three-quarters of the Georgian population now declare themselves to be Orthodox Christians. It is worth noting that, to avoid persecution and to improve career prospects, many of today’s Georgian Christians were Communist Party members or Komsomol members in the Soviet era, and openly repudiated organised religion in general or Christ in particular, not unlike Saint Peter repudiating Christ in Jerusalem on the day of Christ’s crucifixion. Upon sincere demonstration of contrition and metanoia, the Church has joyfully received its former enemies into its midst as brothers and sisters in Christ. This is in the glorious tradition of the Early Church Fathers who joyfully baptised the same Roman troops and civil administrators who had previously persecuted them. Having been accepted “back home” into God’s house, it is imperative for Christians in Georgia to remember the grace that has been bestowed upon them when considering how to deal with the other peoples of the region. The histories of the Georgian and Armenian peoples have been intertwined for millennia, sometimes competitive, sometimes co-operative, but despite the schism over the Council of Chalcedon, it is important for these two peoples to see each other as brothers and sisters in Christ with some outstanding disagreements, rather than as intractable antagonists. Thousands of Coptic Christians have settled in Georgia, fleeing religious persecution in their homeland, but the welcome they have received from Georgian Orthodox parishes when seeking to pray in the temple has often been less than effusive. Some wonderful opportunities to embrace new arrivals or long-standing ethnic minorities as brothers and sisters in Christ, to baptise or chrismate them, and to gently integrate them into Georgian society, have sadly been lost, with some people behaving like the prodigal son’s older brother, filled with anger and resentment when schismatics seek to return home. At various times in history, many of the people of the North Caucasus, Iran, Azerbaijan, and Turkey had accepted baptism and were vigourous members of the One, Holy, Catholic and Apostolic Church. Georgian missionaries played no small part in this, using their God-given abilities as orators, teachers and healers to bring the word of God to these regions, and many gave their lives to enlighten these neighbouring peoples, whom they viewed as being equally worthy of salvation as their own people. It is a mark of contempt for these great Georgian evangelists that some people today, claiming to speak for the Church, seek to denigrate or insult neighbouring people of different religions or races simply because they are not Kartvelian. Many Muslims from neighbouring countries had Christian ancestors who were forced into apostasy under threat of torture or execution. I have discussed before the Christian civilisation of the Caucasian Albanians of Azerbaijan, the Christian communities established by Georgian missionaries in Ossetia and Daghestan, and the hundreds of thousands of Christians who inhabited every major town and city in the Persian Empire in the past. Many Muslims from the region are curious about Christianity and are very open to discussing our religion, and not a few are willing to apostasise themselves from Islam and accept Christian baptism when dealt with kindly. When confronted with a person considering “returning home” to the Church, even from a nationality or faith that some consider to be an intractable enemy of the Georgian Church, it is important to consider that we all have been welcomed home by our Father through His grace rather than our own virtue. To reject our neighbours’ sincere approaches places us, rather unfavourably, in the role of the elder brother of the prodigal son. Unlike the elder brother, many of us in the past were in open opposition to God’s Church in Georgia; while the elder brother could with some justification say “Lo, these many years do I serve thee, neither transgressed I at any time thy commandment”, there are precious few of us here can truthfully say the same. For those still in two minds on this issue, one can direct them to the will of the Holy Spirit as expressed in Saint Peter’s vision in Acts 10. It has long been a source of annoyance to some people, local and foreign, that the Georgian government provides funding to the Georgian Church. For those coming from countries with a complete separation between Church and State, such as France or the United States, it is a very unfamiliar situation. For people coming from countries with an official State Church, such as the United Kingdom or Denmark, it is a more familiar situation. The relationship between Church and State in Georgia is an interesting one. The Republic of Georgia is a secular state without a State Church. Unlike other states, there are no seats in parliament allocated to bishops or other religious leaders (as is the case in the United Kingdom and China). However, the Church has a very large role in people’s lives and State leaders not infrequently canvass the opinion of the Patriarch and bishops when determining policy directions. (1) The agreement confirmed that all churches and monasteries on Georgian territory are owned by the Georgian Church, with the exception of those in private hands. (2) The agreement recognises the special role of the Georgian Church in Georgian history and devolves authority over all religious matters to the Georgian Church. (3) The agreement grants the Patriarch immunity from prosecution and exempts clergy from the Georgian Church from compulsory military service. (4) The agreement grants the Georgian Church an exclusive role in operating the military chaplaincy. (5) The agreement grants the Georgian Church a substantial advisory role in government, particularly in the educational sphere. (6) The agreement recognises the validity of marriages performed in the Church (while still requiring government registration for legal issues). (7) As a partial owner of assets confiscated by Soviet authorities during the Soviet rule of Georgia (1921-1991), the State agrees to compensate, at least in part, the Georgian Church for its financial and asset losses incurred during that period. The seventh point is an interesting one. The Concordat was agreed in 2002 between His Holiness Patriarch Ilia II and President Eduard Shevardnadze. The President was from a Gurian Bolshevik family with revolutionary credentials, and in addition to having been Foreign Minister of the Soviet Union, he had also been the First Secretary of the Georgian Communist Party (the de facto Head of State of the Georgian Soviet Socialist Republic (GSSR)). The Party which he had headed had in the past engaged in atrocities and persecution of Georgian Christians, but a mere 11 years after the collapse of the Soviet Union and in the immediate aftermath of a brutal civil war, Shevardnadze was not willing to admit substantial responsibility for past misdeeds of his former Party or government. From the 1990’s to the current day, most of the political and business elite in Georgia were children or close relatives of Communist Party officials, or had developed a power base in the Komsomol ( All-Union Leninist Young Communist League ). During the Soviet era, identifying publicly as an Orthodox Christian had serious consequences; one could not join the Party or Komsomol, admission to universities was almost impossible, and promotion within State bodies was seriously hampered. Hence, when Georgia became independent, very few of the political elite or intelligentsia came from openly practicing Christian families, and many had engaged in discrimination or persecution of Christians during their official duties prior to 1991. Faced with a resurgent Church, the elite needed to make some compromises with the Church, lest their own conduct and the conduct of their families in the past be brought to light. Church and State negotiated the best deal they could realistically get at the time. With the chaos of the 1990’s in such recent memory, the Church also was wary of going after Communists for compensation and justice too vigourously lest the delicate political balance established be upset. The Bolshevik takeover of Georgia in 1921 was followed by serious persecution of the Church, as mentioned in my posts before, here, and here. Many thousands of clergy were murdered or exiled to labour camps where they died of disease, cold or malnutrition. Tens of thousands of ordinary Orthodox Christian laity likewise were murdered for their faith, or died in prison camps. Hundreds of thousands had their lives and careers ruined by persecution and discrimination by Communist authorities. To date, not one cent of compensation has been paid to the Church for the wrongful deaths of its martyred clergy. Likewise, the families of martyred laity have yet to receive any compensation. As a successor regime to the GSSR, the Government of the Republic of Georgia bears responsibility for achieving justice for those wronged by its predecessor, but to date nobody has had the courage to do so. Given that many of the elite have family members complicit in past atrocities and persecution, this is not surprising. It is therefore perplexing to Georgian Orthodox Christians when local secularists and foreigners complain about State funding of the Church. A local article disclosing financial transfers from the State Treasury to the Church can be found here . I cannot vouch for the veracity or otherwise of those figures but they appear to be based on valid government records; a total of GEL200 million since independence is suggested. Given that the new Parliament House in Kutaisi alone has cost over GEL325 million since work started in 2012, the Church’s subventions are a rather minor part of State expenditures in comparison. In 1921, the Georgian Church was the largest single landowner in the country; that land was confiscated and most of it has not been returned. No formal mechanism of restitution for these assets has been settled upon. Seventy years worth of lost revenue from those assets has also not been considered. Hundreds of temples and monasteries were razed to the ground by the Bolksheviks; State funding for the building of new temples and renovation of old structures is hence an appropriate measure of compensation under the terms of the Concordat. Anyone walking around a temple on Sunday morning in any town or village in Georgia can attest to the overcrowding that is routine, with many hundreds of people often standing in the rain or snow outside for services at Feasts. Hence, State support for such construction activities is a compensation payment rather than a subsidy per se. Some State funds provided to the Church are dedicated to the Church’s charitable activities, such as its hospitals, orphanages, educational facilities and charitable funds, such as the Lazarus Fund. As the most trusted institution in the country, government officials obviously consider subvention of Church charity work to be a worthwhile use of public funds. Some Georgian political parties have lobbied for the Concordat to be superseded by the Georgian Church becoming an official State Church and therefore an arm of the State. To date the Patriarch has rejected this concept, saying that he would prefer the existing arrangement to be implemented more fully. No doubt the Church hierarchs are aware that countries with State Churches tend to suffer decreasing levels of religiosity amongst the laity. Likewise, they are aware of the Georgian Church’s forcible incorporation into the Holy Synod of the Church of Russia in the early 19th century, where as an arm of the official State Church they were ruled by Russian civil servants instead of bishops. The experience was not a happy one and clergy are aware that the Church needs a certain level of autonomy from the State to fulfil its mission faithfully. The freedom for clergy to occasionally criticise State policy where appropriate can only be preserved if the Church is not an arm of the State. Personally, I believe that a one-off property settlement between Church and State would be preferable to ongoing year-by-year subvention, as this would allow the Church to be financially independent of the State and to faithfully fulfil its mission without fear of of State officials cutting off funds when displeased. Other Georgian Orthodox Christians will have opinions very different to mine of course. Pascha; a Reminiscence from the Gulag. Should at any time we feel ourselves to be alone, or for the secular world to be so overwhelming and powerful as to render spiritual life redundant, we can reflect on the difficulties of our predecessors and be inspired by their cheerfulness and joy in the face of tremendous privations. As mentioned before, the mid 1920’s was a period of ferocious attacks upon the Church by the Bolsheviks, both clergy and laity. Many of the faithful were executed or imprisoned in the Gulag for extended periods on nonsensical charges. The Solovetsky Island concentration camp (Solovki for short), formerly a remote monastery on an island in the White Sea region of Russia’s far north, was reserved for particularly “recalcitrant” prisoners, in particular priests from throughout the Soviet Union, including the newly annexed Georgian Soviet Socialist Republic. Conditions were brutal and fatalities commonplace. This letter from Bishop Maxim of Serpukhov, a Russian priest, is a moving testament to the resilience and cheerfulness of interned clergy during tremendous oppression. The Paschal context of his letter is poignant for us this week. At Solovki we had several secret Catacomb “churches,” but our “favorites” were two: the “Cathedral Church” of the Holy Trinity, and the church of St. Nicholas the Wonderworker. The first was a small clearing in the midst of a dense forest in the direction of the “Savvaty” Assignment Area. The dome of this church was the sky, The wails were the birch forest. The church of St. Nicholas was located in the deep forest towards the “Muksolm” Assignment Area, It was a thicket naturally formed by seven large spruces. Most frequently the secret services were conducted only in the summer, on great feasts and, with special solemnity, on the Day of Pentecost. But sometimes, depending on circumstances, doubly secret services were celebrated also in other places. Thus, for example, on Great Thursday of 1929, the service of the reading of the Twelve Gospels was celebrated in our physicians’ cell in the 10th Company, Vladika Victor and Fr. Nicholas came to us as if for disinfection. Then, catacomb style, they served the church service with the door bolted. On Great Friday an order was read in all Companies informing that for the next three days no one would be allowed to leave the Companies after 8 p.m. save in exceptional circumstances and by special written permit of the Camp Commandant. In half an hour Vladika Maxim and I left our Company and started out for the indicated “address.” Twice patrols asked for our permits. We, as physicians, had them. But what about the others?–Vladika Victor, Vladika Ilarion, Vladika Nektary, and Fr. Nicholas? Vladika Victor worked as-a bookkeeper in the rope factory. Vladika Nektary was a fisherman; and the others weaved nets. Here was the edge of the forest. Here was the box, about nine yards long, without windows, the door scarcely noticeable. Light twilight, the sky covered with dark clouds. We knock three times and then twice. Fr. Nicholas opens. Vladika Victor and Vladika Ilarion are already here… In a few minutes Vladika Nektary also comes. The interior of the box has been converted into a church. On the floor, on the wails, spruce branches. Several candles flickering. Small paper icons. The small Plashanitsa is buried in green branches. Ten people have come to pray. Later another four or five come, of whom two are monks. The service begins, in a whisper. It seemed that we had no bodies, but were only souls. Nothing distracted or interfered with prayer… I don’t remember how we went “home,” i.e., to our Companies. The Lord covered us! The bright service of Pascha was assigned to our physicians’ cell. Towards midnight under various urgent pretexts arranged by the section, without any kind of written permit, all who intended to come gathered, about fifteen people in all. After the Matins and Liturgy, we sat down and broke the fast. On the table were Paschal cake and cheese, colored eggs, cold dishes, wine (liquid yeast with cranberry extract and sugar). About three o’clock we parted. Control rounds of our Company were made by the Camp Commandant before and after the services, at 11 p.m. and 4 a.m. Finding us four physicians headed by Vladika Maxim, on his last round, the Commandant said: “What doctors, you’re not sleeping?” And immediately he added: “Such a night…and one doesn’t want to sleep!” And he left. “Lord Jesus Christ! We thank Thee for the miracle of Thy mercy and power,” pronounced Vladika Maxim movingly, expressing our common feelings. The white night of Solovki was nearing its end. The delicate, rose-colored Paschal morning of Solovki, the sun playing for joy, greeted the monastery-concentration camp, converting it into the invisible city of Kitezh and filling our free Souls with a quiet, unearthly joy. Following immediately after the celebration of the Georgian Church’s Autocephaly, we commemorate the life of Saint Ambrosi, Catholicos-Patriarch of All Georgia in the turbulent 1920’s when Georgia was overrun by the Red Army and forcibly incorporated into the Soviet Union. Saint Ambrosi is seen as a bold and patriotic figure who was frequently in trouble with secular authority. 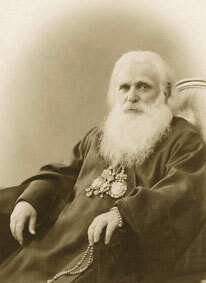 He was persecuted by the Russian colonial authorities for agitating for the Georgian Church’s autocephaly to be restored, and likewise persecuted during the early years of the Bolshevik regime for his faith, as a means of intimidating the laity. Our father among the saints Ambrose (Khelaia) the Confessor, (Georgian: (ამბროსი აღმსარებელი, Ambrosi Aghmsarebeli), was the Catholicos–Patriarch of All Georgia of the restored Church of Georgia. He was Catholicos-Patriarch from 1921 to 1927. He is commemorated of March 16. Besarion Khelaia was born on September 7, 1861 in Martvili, Georgia. He received his primary education at the theological school in Samegrelo, before entering the Tiblisi Theological Seminary. After his graduation in 1885, Besarion married, and then was ordained to the Holy Orders later that year. Fr. Besarion served as priest in Abkhazia for eight years in Sukhumi, New Athos, and Lykhy. In addition to his priestly duties, Fr. Besarion taught the Georgian language and participated in a number of philanthropic organizations. He also published a series of articles under the pseudonym of Amber denouncing the policy of Russification in Abkhazia. In 1896, Fr. Besarion’s wife died. In 1897, he enrolled in the Kazan Theological Academy. During his time at the academy, Fr. Besarion was interested in both the literary-cultural life of Kazan and in Georgian national independence. His research in the primary sources about the history of Georgia produced several essays including one entitled “The Struggle Between Christianity and Islam in Georgia”. One professor recommended that he continue on that theme and present his research for a master’s degree. Fr. Besarion graduated from the Kazan academy in 1901 and, before returning to Georgia, received his tonsure as a monk, with the name Ambrose. In Georgia, Fr. Ambrose was raised to the dignity of archimandrite and appointed abbot of Chelishi Monastery in Racha province where he joined with other Georgians in fighting for restoration of autocephaly of the Church of Georgia. At Chelishi, Archim. Ambrose, with the blessing of Bishop Leonid of Imereti, restored the deteriorating monastery and seminary, and attracted gifted young people to study at the seminary. In 1904, Archim. Ambrose was transferred to the Synodal office in Tbilisi and was named abbot of the Monastery of the Transfiguration.The Georgian hierarchy continued to press for restoration of autocephaly without success, pointing out to Tsar Nicholas II the deterioration in church life and organization that had occurred under the exarchate. The 1905 council of Georgian clergy in Tbilisi, in which Archim. Ambrose participated, was broken up by police. This incident resulted in his exile to the Troitsky Monastery at Ryazan. In 1908, Archim. Ambrose was accused of conspiring in the murder of the Exarch of Georgia, Abp. Nikon (Sofiisky) and was deprived of the right to serve in the Church. This time, he was exiled to the Holy Trinity Monastery in Ryazan where for a year he was held under strict guard until he was acquitted and reinstated with his rights. But, he was still kept in Russia. As Russia was overtaken by the chaos of the 1917 revolutions, Archim. Ambrose returned to Georgia in 1917 and rejoined the struggle for restoration of autocephaly of the Georgian Church. On March 12, 1917, a Georgian synod proclaimed autocephaly, and elected Bishop Kirion Catholicos-Patriarch, actions that the Holy Synod of the Church of Russia refused to recognize. Thus, communion was broken between the two churches. With autocephaly, Archim. Ambrose was consecrated Metropolitan of Chqondidi. He was later transferred to Tskum-Abkhazeti. In March 1921, Bolsheviks forces overthrew the short-lived Democratic Republic of Georgia, outlawed the Church, closed the churches and monasteries, and began the persecution of the clergy. Amidst the chaos, Catholicos-Patriarch Leonid died from cholera. Elected on September 7, 1921, Metr. Ambrose was enthroned Catholicos-Patriarch of All Georgia on October 14, 1921. On February 7, 1922, Catholicos-Patriarch Ambrose sent a memorandum to the Conference of Genoa describing the conditions under which Georgia was living since the Soviet invasion, and protested in the name of the people of Georgia who had been deprived of their rights, against the occupation of Georgia by the Soviets, and demanded the intervention of civilized humanity to oppose the atrocities of the Bolshevik regime. While expecting execution, the Bolsheviks did not dare to execute him and sentenced Patr. Ambrose to eight years imprisonment. His property was also confiscated. During the time of his imprisonment from 1923, Metr. Kalistrate was locum tenens. The public outcry over the extent of the Red Terror in Georgia caused the Bolsheviks to moderate their pressure on Georgian society. In March 1926, the Bolsheviks put forward an amnesty for the 1924 insurrection and suspension of religious persecutions. Later in 1926, Ambrose and a few Georgian clergy were released from prison. However, the strains of the years showed, and Patr. Ambrose soon reposed in Tbilisi on March 29, 1927. At an expanded council of the Holy Synod of the Church of Georgia in 1995, the life of Ambrose (Khelaia), Catholicos-Patriarch of All Georgia was discussed and in recognition of his great achievements he was glorified in behalf of the Georgian Church and nation as St. Ambrose the Confessor.